I am always looking for a way to work my grills into dinner. If there is even just one part of a recipe that can be adapted for the backyard, I’ll make it work. So, when Samuel Adams and Chef David Burke teamed up for some unique takes on “pigs in a blanket,” I knew my Webers had their work cut out. These babies were going on the grill. 1. Preheat the grill 10-15 minutes and prepare it for indirect medium-high heat. My Weber Original Gourmet BBQ System Sear Grate worked great to support the delicate blankets. 2. In a large pot on the side burner over medium-low heat, toast all of the dry spices (cumin, coriander seed, celery seed, paprika, chili powder). Once the spices are toasted (you’ll begin to smell their aroma,) add the honey and brown sugar, and cook until it begins to caramelize. 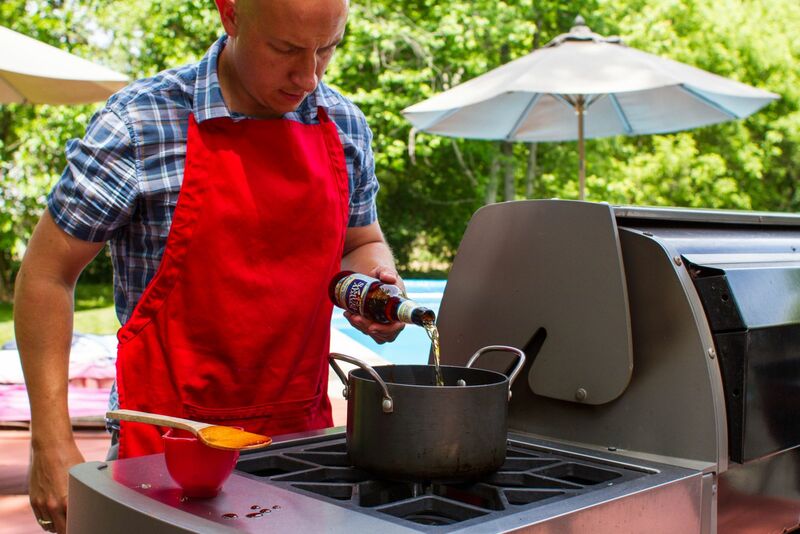 Once the mixture begins to caramelize, add the red wine vinegar, ketchup, soy sauce, chili sauce, and Samuel Adams Boston Lager. Continue to add the lemon juice and zest, orange juice and zest, and reduce until the mixture thickens. Season the mixture with salt, pepper and cilantro. Let it stand for two hours, then strain through a fine-mesh, conical sieve. 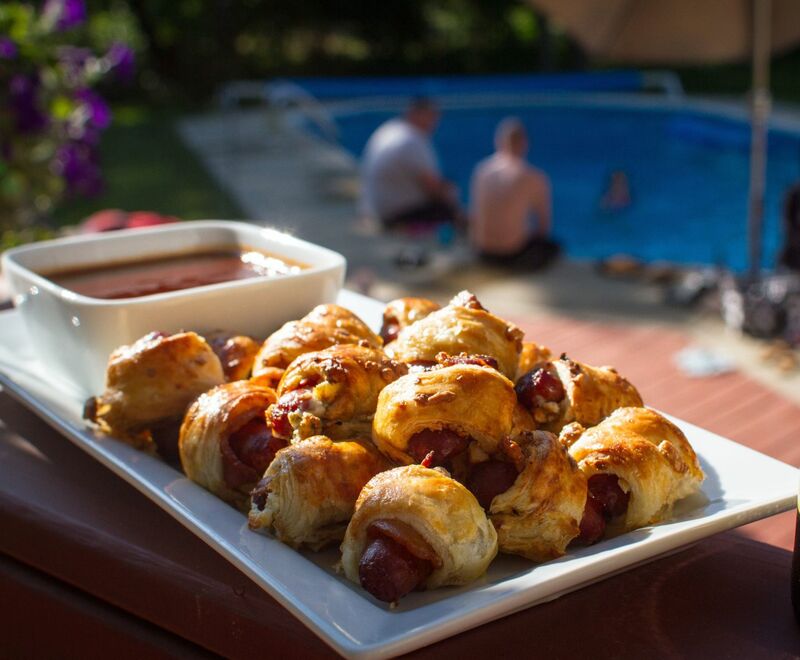 Place in a serving bowl and serve between room temperature and warm as a dipping sauce for the Bacon Blue Cheese Dogs. 3. On a baking tray, grill the bacon over indirect medium heat at 375° F for about 12 minutes, until slightly brown but still pliable (which is exactly how I like my bacon!). 4. 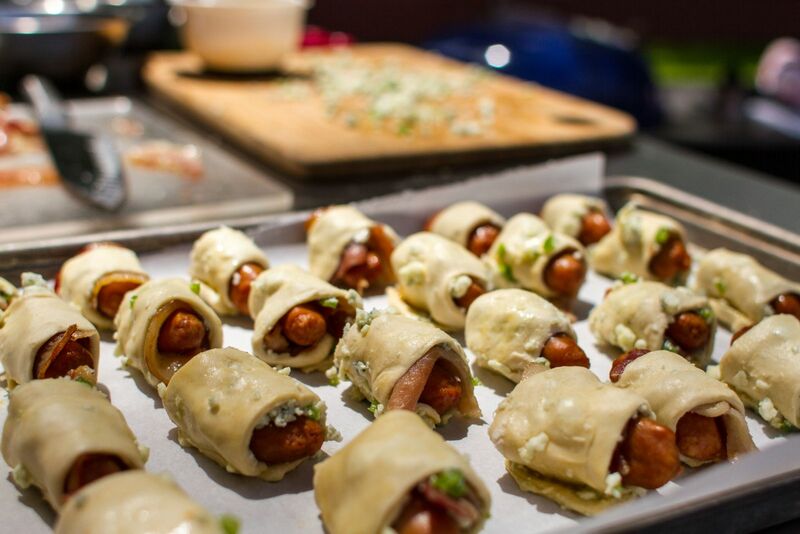 Before rolling the cocktail franks in puff pastry, mash together the blue cheese and minced jalapeño peppers. 5. Unfold the puff pastry. Crumble the mixture onto the puff pastry. 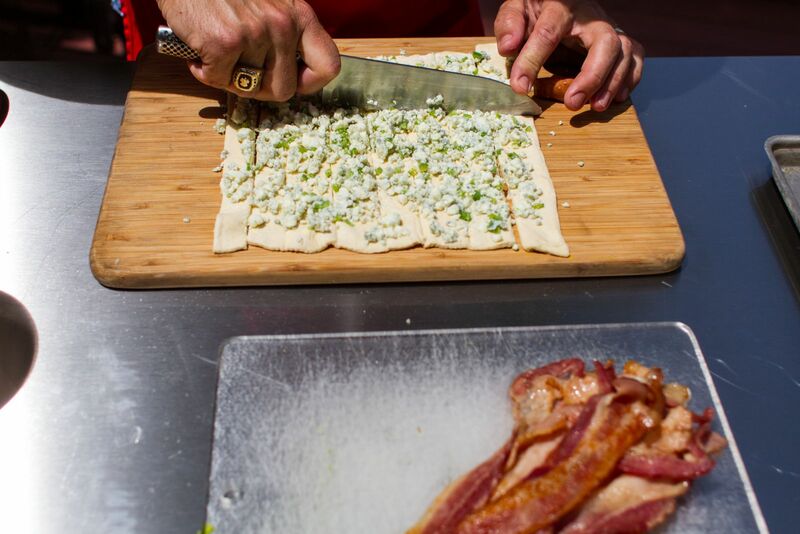 Cut the puff pastry into 1 inch wide strips. They should be wide enough to roll a cocktail frank and leave some overlap per frank. The size of the pastry strips is really “frank size dependent,” if you get my drift. 6. 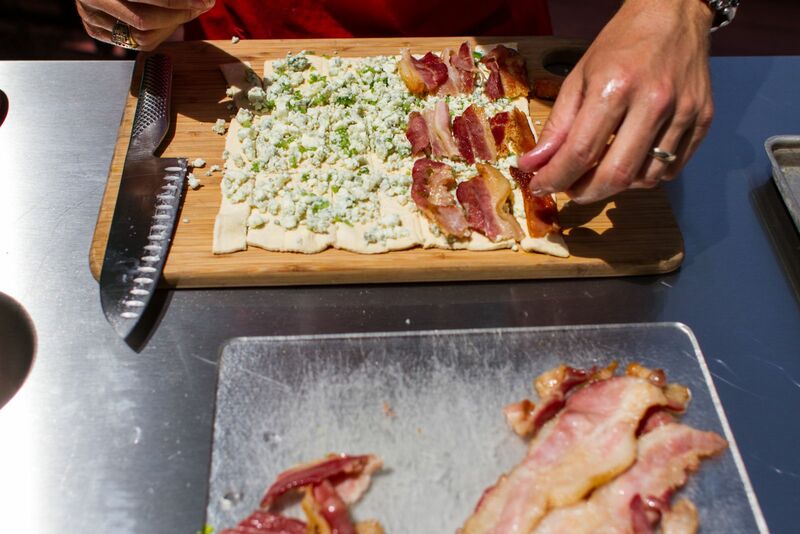 Place the rolled Pigs in a Blanket, seam side down, on a parchment lined sheet tray, and brush with the egg wash (one egg beaten with one tsp of water). 7. Grill indirect for approximately 15-20 minutes, or until the puff pastry is nicely browned. Remove, and serve with the sauce. 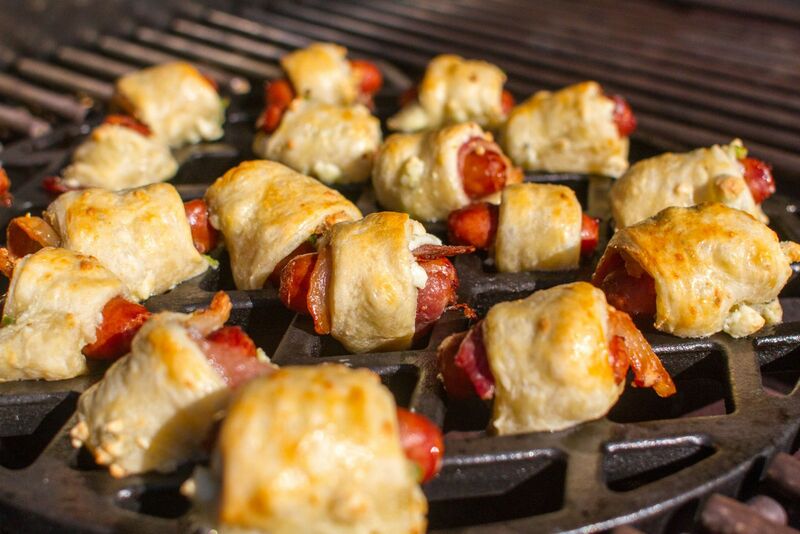 Great grill marks and these dogs won't fall through. Use this tool to brush the egg wash on the puff pastry. This recipe calls for beer!